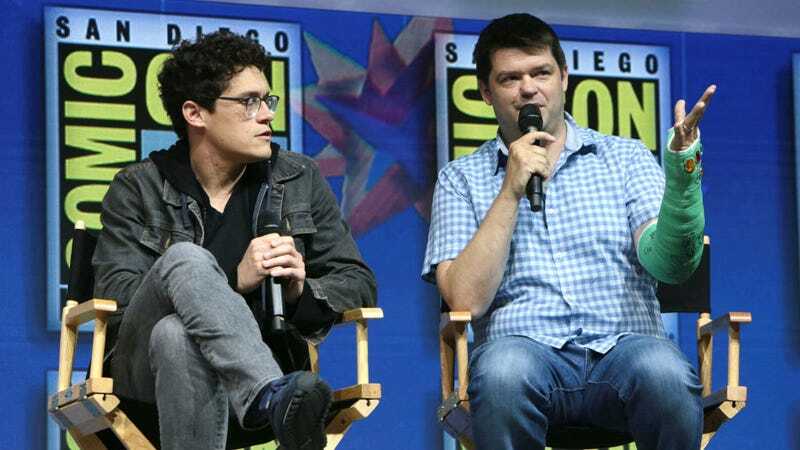 Phil Lord and Chris Miller at San Diego Comic-Con 2018 talking The Lego Movie 2. The fact that we’ll never see a Phil Lord and Chris Miller Han Solo movie is still hard to swallow. Whether you like the Ron Howard film or not, fans will forever imagine what the directors of 21 Jump Street and The Lego Movie would have done with that script. And yet, there’s a trade-off. Lord and Miller produced both Spider-Man: Into the Spider-Verse and The Lego Movie 2: The Second Part, with Lord co-writing Spider-Verse and the pair writing all of The Lego Movie 2. Both of those movies were in production at the same time as Solo, so it’s safe to assume that if the pair completed Solo, neither of those movies would be exactly what they are. Are you okay giving up a Lord and Miller Solo movie to have something as perfect as Into the Spider-Verse exist or a better Lego Movie sequel? It’s a question fans will certainly have to wrestle with. But, at the junket for The Lego Movie 2, we asked Lord and Miller how their leaving Solo helped improve the two animated features, one of which is now the odds-on-favorite to win the Oscar for Best Animated Feature. But what does that mean exactly? Lego Movie 2 director Mike Mitchell explained. The pair agreed that the increased collaboration was the main benefit of the whole thing. In the end, that’s the silver lining. No, we’ll never see what Solo: A Star Wars Story directed by Lord and Miller would have been. But, in its place, we have the best possible versions of two other movies. It’s not ideal, but it’s not bad either. We’ll have more from Lord, Miller, Mitchell, and The Lego Movie 2 soon. The film opens February 8.